"Robot exoskeleton" redirects here. For the type of machine, see powered exoskeleton. 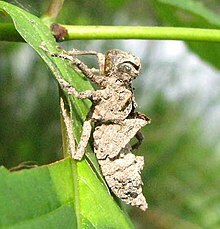 Exoskeletons contain rigid and resistant components that fulfill a set of functional roles in many animals including protection, excretion, sensing, support, feeding and acting as a barrier against desiccation in terrestrial organisms. Exoskeletons have a role in defense from pests and predators, support, and in providing an attachment framework for musculature. Exoskeletons have evolved independently many times; 18 lineages evolved calcified exoskeletons alone. Further, other lineages have produced tough outer coatings analogous to an exoskeleton, such as some mammals. This coating is constructed from bone in the armadillo, and hair in the pangolin. The armor of reptiles like turtles and dinosaurs like Ankylosaurs is constructed of bone; crocodiles have bony scutes and horny scales. Since exoskeletons are rigid, they present some limits to growth. Organisms with open shells can grow by adding new material to the aperture of their shell, as is the case in snails, bivalves and other molluscans. A true exoskeleton, like that found in arthropods, must be shed (moulted) when it is outgrown. A new exoskeleton is produced beneath the old one. As the old one is shed, the new skeleton is soft and pliable. The animal will pump itself up[ambiguous] to expand the new shell to maximal size, then let it harden. When the shell has set, the empty space inside the new skeleton can be filled up as the animal eats. 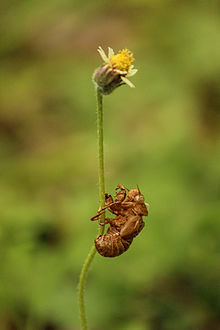 Failure to shed the exoskeleton once outgrown can result in the animal being suffocated within its own shell, and will stop subadults from reaching maturity, thus preventing them from reproducing. This is the mechanism behind some insect pesticides, such as Azadirachtin. On the whole, the fossil record only contains mineralised exoskeletons, since these are by far the most durable. Since most lineages with exoskeletons are thought to have started out with a non-mineralised exoskeleton which they later mineralised, this makes it difficult to comment on the very early evolution of each lineage's exoskeleton. It is known, however, that in a very short course of time, just before the Cambrian period, exoskeletons made of various materials – silica, calcium phosphate, calcite, aragonite, and even glued-together mineral flakes – sprang up in a range of different environments. Most lineages adopted the form of calcium carbonate which was stable in the ocean at the time they first mineralised, and did not change from this mineral morph - even when it became the less favorable. Some Precambrian (Ediacaran) organisms produced tough but non-mineralized outer shells, while others, such as Cloudina, had a calcified exoskeleton, but mineralized skeletons did not become common until the beginning of the Cambrian period, with the rise of the "small shelly fauna". Just after the base of the Cambrian, these miniature fossils become diverse and abundant – this abruptness may be an illusion, since the chemical conditions which preserved the small shellies appeared at the same time. Most other shell-forming organisms appear during the Cambrian period, with the Bryozoans being the only calcifying phylum to appear later, in the Ordovician. The sudden appearance of shells has been linked to a change in ocean chemistry which made the calcium compounds of which the shells are constructed stable enough to be precipitated into a shell. However this is unlikely to be a sufficient cause, as the main construction cost of shells is in creating the proteins and polysaccharides required for the shell's composite structure, not in the precipitation of the mineral components. Skeletonization also appeared at almost exactly the same time that animals started burrowing to avoid predation, and one of the earliest exoskeletons was made of glued-together mineral flakes, suggesting that skeletonization was likewise a response to increased pressure from predators. With the exception of the molluscs, whose shells often comprise both forms, most lineages use just one form of the mineral. The form used appears to reflect the seawater chemistry – thus which form was more easily precipitated – at the time that the lineage first evolved a calcified skeleton, and does not change thereafter. However, the relative abundance of calcite- and aragonite-using lineages does not reflect subsequent seawater chemistry – the magnesium/calcium ratio of the oceans appears to have a negligible impact on organisms' success, which is instead controlled mainly by how well they recover from mass extinctions. A recently discovered modern gastropod Chrysomallon squamiferum that lives near deep-sea hydrothermal vents illustrates the influence of both ancient and modern local chemical environments: its shell is made of aragonite, which is found in some of the earliest fossil mollusks; but it also has armor plates on the sides of its foot, and these are mineralized with the iron sulfides pyrite and greigite, which had never previously been found in any metazoan but whose ingredients are emitted in large quantities by the vents. ^ "exoskeleton". Online Etymology Dictionary. Archived from the original on 2013-04-20. ^ a b c S. Bengtson (2004). "Early skeletal fossils" (PDF). In J. H. Lipps; B. M. Waggoner. Neoproterozoic–Cambrian Biological Revolutions. Paleontological Society Papers. 10. pp. 67–78. Archived from the original (PDF) on 2008-10-03. ^ H. C. Bennet-Clark (1975). "The energetics of the jump of the locust, Schistocerca gregaria" (PDF). Journal of Experimental Biology. 63 (1): 53–83. PMID 1159370. ^ a b c Susannah M. Porter (2007). "Seawater chemistry and early carbonate biomineralization". Science. 316 (5829): 1302. Bibcode:2007Sci...316.1302P. doi:10.1126/science.1137284. PMID 17540895. ^ a b John Ewer (2005-10-11). "How the Ecdysozoan Changed Its Coat". PLoS Biology. 3 (10): e349. doi:10.1371/journal.pbio.0030349. PMC 1250302. PMID 16207077. ^ Gemma E. Veitch; Edith Beckmann; Brenda J. Burke; Alistair Boyer; Sarah L. Maslen; Steven V. Ley (2007). "Synthesis of Azadirachtin: A Long but Successful Journey". Angewandte Chemie International Edition. 46 (40): 7629–32. doi:10.1002/anie.200703027. PMID 17665403. ^ a b c d M. A. Fedonkin; A. Simonetta; A. Y. Ivantsov (2007). "New data on Kimberella, the Vendian mollusk-like organism (White sea region, Russia): palaeoecological and evolutionary implications". In Patricia Vickers-Rich & Patricia. The Rise and Fall of the Ediacaran Biota. 286. London: Geological Society. pp. 157–179. Bibcode:2007GSLSP.286..157F. doi:10.1144/SP286.12. ISBN 978-1-86239-233-5. OCLC 191881597. ^ Nicholas J. Butterfield (2003). "Exceptional fossil preservation and the Cambrian Explosion". Integrative and Comparative Biology. 43 (1): 166–177. doi:10.1093/icb/43.1.166. PMID 21680421. ^ Richard Cowen (2004). History of Life (4th ed.). Wiley-Blackwell. ISBN 978-1-4051-1756-2. ^ a b c Hong Hua; Brian R. Pratt; Lu-yi Zhang (2003). "Borings in Cloudina shells: complex predator-prey dynamics in the terminal Neoproterozoic". Palaios. 18 (4–5): 454–459. doi:10.1669/0883-1351(2003)018<0454:BICSCP>2.0.CO;2. ^ a b J. Dzik (2007). "The Verdun Syndrome: simultaneous origin of protective armor and infaunal shelters at the Precambrian–Cambrian transition" (PDF). In Patricia Vickers-Rich & Patricia. The Rise and Fall of the Ediacaran Biota. Geological Society, London, Special Publications. 286. London: Geological Society. pp. 405–414. Bibcode:2007GSLSP.286..405D. CiteSeerX 10.1.1.693.9187. doi:10.1144/SP286.30. ISBN 978-1-86239-233-5. OCLC 191881597. Archived (PDF) from the original on 2008-10-03. ^ J. Dzik (1994). "Evolution of 'small shelly fossils' assemblages of the early Paleozoic". Acta Palaeontologica Polonica. 39 (3): 27–313. Archived from the original on 2008-12-05. ^ Wolfgang Kiessling; Martin Aberhan; Loïc Villier (2008). "Phanerozoic trends in skeletal mineralogy driven by mass extinctions". Nature Geoscience. 1 (8): 527–530. Bibcode:2008NatGe...1..527K. doi:10.1038/ngeo251. ^ Anders Warén; Stefan Bengtson; Shana K. Goffredi; Cindy L. Van Dover (2003). "A hot-vent gastropod with iron sulfide dermal sclerites". Science. 302 (5647): 1007. doi:10.1126/science.1087696. PMID 14605361. Look up exoskeleton in Wiktionary, the free dictionary.